That’s Johnson’s entry for the letter “S” in his famous dictionary, and it’s clear that there’s something amiss with his lower-case s—in its printed form it looks more like an f, most of the time. This feature of 18th-century writing and typography has led some people to casually (but wrongly) deduce one of two things—either that the letter f had a sibilant sound during that period, or that people pronounced their words differently, with a sort of strange lisp. Actually, what we’re seeing in Johnson’s dictionary is the “medial s” or “long s“. For centuries, there were two distinct ways of writing the lower-case letter s, and only the “terminal s” or “short s” has come down to us today. Usage of the long s petered out during the nineteenth century. Italic preserves the long descender and double curve that makes clear why this letter was called the “long s“. In a Roman typeface, the letter retained only its upper curve, and stopped stubbily at the baseline. It was sometimes adorned with a little beak on its left side at the x-height, which compounded the confusion with the letter f, which was distinguished from the long s only by having a crossbar rather than a beak. The rules for its use were variable. As the alternative name “medial s” suggests, the long s was used primarily in the middle of words, with our familiar “terminal s” being used at the end. It could also start a word, but not if that word began with a capital letter, since there was no capital version of the long s—or rather, one capital letter served both lower-case versions. 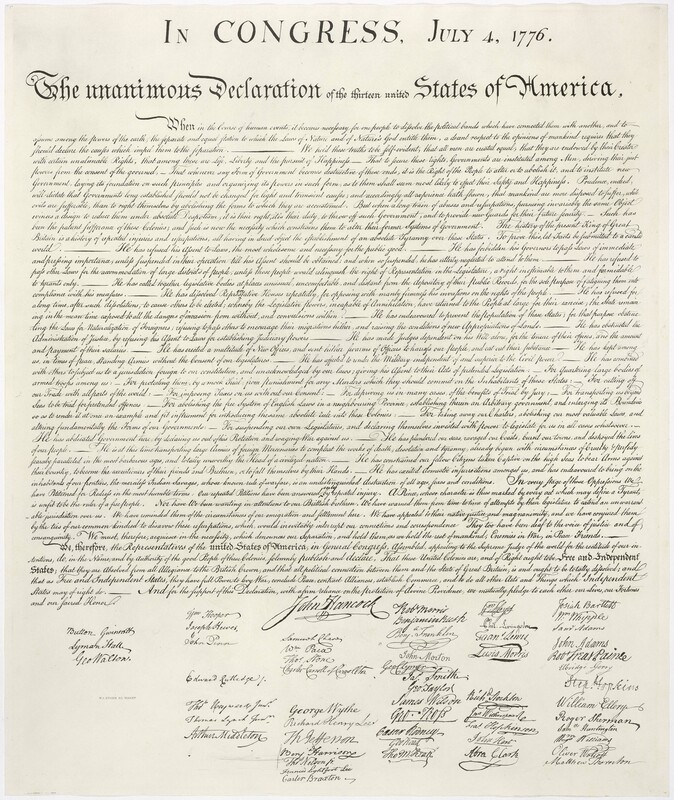 The variability in its use is pointed up rather nicely if we compare the opening words of the hand-written version of the American Declaration of Independence with the first printed version. In both cases, we see the terminal s being used at the end of words, but in the written version it also appears as the second letter in each example of a doubled s, and in the word “Course”. Which is exactly the price tag that John Tenniel placed in the Mad Hatter’s top-hat when he illustrated Lewis Carroll‘s novel, Alice’s Adventures in Wonderland, back in 1865. And that diagonal line is still referred to as a solidus, commemorating its long-defunct role as an abbreviation for “shillings”. Either way, the long s is still lurking in the left half of the eszett. Finally, there was a little-known effort to revive the long s, under slightly bizarre circumstances, in Central Asia in the 1990s. When the Boon Companion and I visited the region just after the break-up of the Soviet Union, some of the newly independent Central Asian republics were keen to distance themselves from the Russian past by discarding the colonial Cyrillic alphabet. In Turkmenistan, posters were being displayed in the street showing the proposed new Latin alphabet, adapted for the Turkmen language, so that citizens could study this particularly dramatic spelling reform. Unfortunately, there are sounds in Turkmen for which Cyrillic provides a single letter, but the Latin alphabet does not. It’s a very common problem (it occurs in English, too), and it’s usually worked around by using combinations of Latin letters (as we do in English), or by adding diacritics to single letters. But the Turkmen government had decided to take a different approach. To replace Cyrillic Ш (pronounced “sh”) they used the symbol for American cents ( ¢ ), which they capitalized as a dollar sign ( $ ). As if that minuscule/majuscule mismatch wasn’t enough, for Cyrillic Ж (pronounced “zh”) they adopted the long s ( ſ ), capitalized using the pound sign ( £ )! This was so marvellously eccentric I was thoroughly disappointed when the Turkmen Latin alphabet underwent a late revision before it was formally adopted. The Ш has now been replaced with a boring old Turkic s-cedilla ( ş ), and the Ж with an equally boring Eastern-European z-caron ( ž ). Well, of course I do have an endless supply of books, but I don’t copy images from them because of concerns about copyright. So in this post I have a selection of sources that are out of copyright (Johnson, Tenniel, US Declaration of Independence), uncopyrightable (Turkmen/ Russian stamps) or fair use (Aftenposten headline), with links to sources unless ubiquitous. Otherwise I’ve used public domain fonts, or fonts that are made specifically available for non-profit use, with credit noted. I’ve also used an image cropped and tweaked from an original photo provided by a friend. In other posts I do use fair use, public domain or Creative Commons images, with links to the source and licence as necessary. So each post is a bit of an adventure when it comes to finding or creating good material – I think that probably takes up more than half the time I spend. The phrase “Boon Companion” was chosen as a counterpart to the superficial anonymity of “The Oikofuge”, as a way of asserting copyright over images without posting a particular name on-line. It’s also a pleasing antique phrase (well, I think so), the literal truth, and a nod to the phrase “Good Companions” used in the writings of Walt Poucher and J.B. Priestley.